JOHN POPE FURNITURE WELCOMES YOU! John Pope Furniture was voted the Best Retail Furniture Store in Pine Bluff! Our family owned and operated retail furniture store has been in business since 1925. We are in our fourth generation of providing the unparalleled customer service backed up by the lowest prices possible. We offer prompt delivery and set-up throughout Southeast and Central Arkansas. 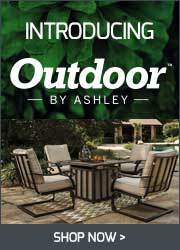 ASHLEY FURNITURE, the #1 selling brand of home furniture in North America, is right at home at your favorite hometown furniture store! Quality, Style, Selection and Service are the cornerstones of Ashley Furniture! These four cornerstones are the guiding principles to Ashley Furniture's mission statement: We want to be the best furniture company. LA-Z-BOY furniture is another famous brand you'll find at Pope Furniture. Things have really evolved since La-Z-Boy first introduced the recliner in 1928. Over the subsequent decades, their product line has grown to include a myriad of pieces and styles, and this brand name has become highly recognized across the country and around the globe. Throughout La-Z-Boy's history, one fact has remained constant: The La-Z-Boy brand name is synonymous with comfort and quality. We offer a wide arrange of bedding options, including a full line of mattresses by the #1 selling company SERTA. We also stock SEALY and SIERRA SLEEP.